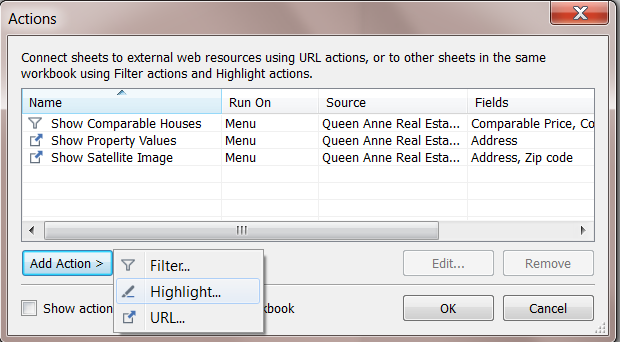 In Tableau Desktop, you can define more advanced highlight actions using the Actions dialog box. There you can specify source and target sheets and the fields you want to use for highlighting. Follow the steps below to create a highlight action. On a worksheet select Worksheet >Actions. From a dashboard, select Dashboard >Actions. In the Actions dialog box click the Add Action button and then select Highlight. 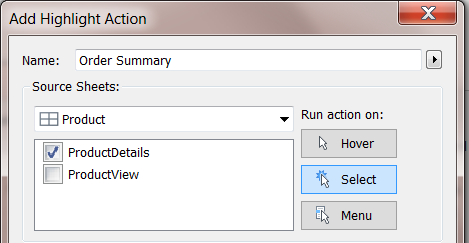 Name the action to identify it in the Actions dialog box. Try to make the name descriptive, such as, Highlight Products Shipped by Delivery Truck. You can select variables from a drop-down list and use them in the name. Then they are filled in based on the values of the selected field. Use the drop-down list to select the source sheet or data source. If you select a data source or a dashboard sheet, you can further select individual sheets within them. Hover - Rest the pointer over a mark in the view to run the action. This option works well for highlight and filter actions within a dashboard. Select - Click a mark in the view to run the action. This option works well for all types of actions. Menu - Right-click (control-click on Mac) a selected mark in the view and then select an option on the context menu. This option works well for filter and URL actions. Select a target sheet. If you select a dashboard, you can further select individual sheets within the dashboard. Selected Fields - Marks in the target sheet are highlighted based on select fields. For example, highlighting using the Ship Mode field will result in an action that highlights all marks in the target sheet that have the same ship mode as the selected mark in the source sheet. Dates and Times - Marks in the target sheet are highlighted when their date and time match those of the marks selected in the source sheet. The source and target worksheets can only have one date field each, however the date fields can have different names. All Fields - Marks in the target sheet are highlighted when they match the marks selected in the source sheet. All fields are considered when determining a match. When finished, click OK twice to close the dialog boxes and return to the view.